Melissa Nunez, a journalism student at Southern Connecticut State University, reported this story in 2017 as part of Journalism Capstone coursework on World War I. While training to serve in World War I, Bristol architect Harold Hayden continued work designing game booths for Lake Compounce and renovations for the Bristol Theatre. Hayden, a lieutenant, went off to serve in World War I in 1917. Historic photo of the Bristol Soldiers’ Memorial Monument. Photo courtesy the Bristol Historical Society. After the war, his architectural background and war service combined to make him the top choice to design the Soldiers’ Memorial Monument of Bristol, which honors the 1,261 Bristol soldiers who served in World War I and the 48 who died. By Hayden’s design, the Soldiers’ Memorial Monument, crafted with Barre granite, features a circular base with steps that led to a five-point service star. Ten bronze tablets line each side of the star, featuring the names of the Bristol soldiers who served in World War I, according to the dedication pamphlet for the Soldiers’ Memorial Monument. It was “peculiarly gratifying” for Bristol to have Hayden design the monument, not only as “one of Bristol’s sons” and “an architect of [the] city,” but also as a soldier who served in the Great War, according to the pamphlet for the April 19, 1924 dedication of the Soldiers’ Memorial Monument. 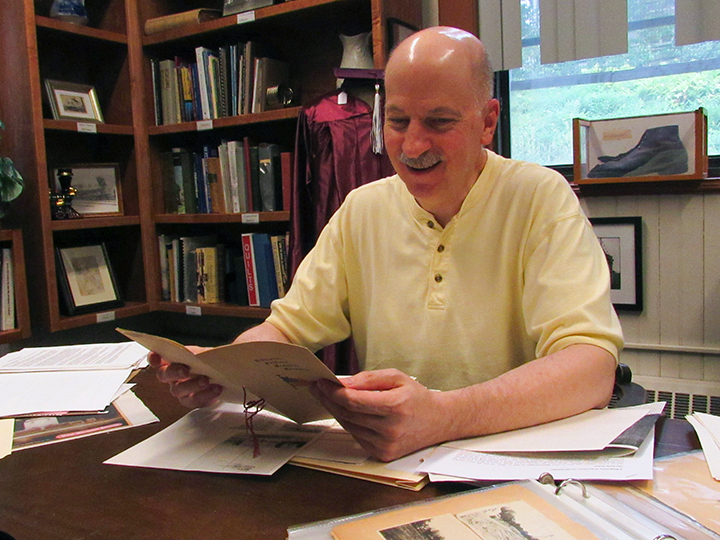 Bristol Historical Society Research Coordinator, Robert Adamczyk looking through the Soldiers’ Memorial Monument dedication pamphlet of April 19, 1924. Photo taken by Melissa Nunez. On the structure above, the names of those who died during their service are paired with major battles, including Champaign Marne, Meuse Argenne, St. Mihiel, Oise-Aisne, and Aisne-Marne. Above the names of the fallen soldiers are bronze emblems representative of the Army, Navy, Marine Corps and Red Cross, as well as the seal for the city of Bristol. Above that, stretches a 25-foot stone, with fluted edges and pointed at the top. The Harrison Granite Company of New York City crafted the monument under Hayden and the memorial stands as a “symbol of a city’s tribute to its men who served their country, and did what they could to preserve its liberty and its honor,” according to the dedication pamphlet. Adamczyk said it cost $2,000 to construct the Soldiers’ Memorial Monument. Bristol held its dedication ceremony on the sixth anniversary of the battle of Seicheprey, where eight Bristol national guardsmen were killed and a number of others were captured or injured. Parks and Recreation Director Brian Wilson said the Parks Department is responsible for maintaining the area. In 2008, the memorial underwent a $24,900 renovation by North Shore Monuments of New York. The work included plaques being re-bronzed, missing or damaged rosettes being replaced, granite being cleaned and de-waxed. Adamczyk said he became aware of Hayden when a Bristol resident cleaned out their attic and found stacks of boxes filled with design plans and blueprints belonging to the architect. The search was on, Adamczyk said, as he began to scour the Bristol Press archives searching for information on the architect. Adamczyk said from that research he found Hayden to be a reserved person who designed many of the focal points in Bristol, including the Central Fire Headquarters on Meadow Street and the East Bristol School, which would later be renamed as the brick addition of the Mary A. Callen School in the 1920s.